Welcome to Fish Window Cleaning MN! We are your local window cleaning company serving Eden Prairie, Chanhassen, Edina, Minnetonka, Wayzata, Chaska, Bloomington, Excelsior, St. Louis Park, Richfield, Hopkins, Victoria, and Waconia, MN. Fish Window Cleaning MN services the entire state of Minnesota including window cleaning in Minneapolis. In the Twin Cities, we have well-established relationships with business and residential customers in the following cities: Bloomington, Chanhassen, Chaska, Deephaven, Edina, Eden Prairie, Excelsior, Greenwood, Hopkins, Minneapolis, Minnetonka, Richfield, Shoreview, St. Louis Park, Tonka Bay, Victoria, Waconia and Wayzata. We provide window cleaning in the Twin Cities! 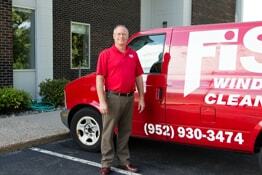 Fish Window Cleaning MN gives your home or business a sparkling-clean first impression to everyone who visits. Our window cleaners show up on time! We proudly service commercial and residential customers throughout Minnesota. In the Twin Cities, we have well-established relationships for business window cleaning and residential window cleaning customers in the following cities: Bloomington, Chanhassen, Chaska, Deephaven, Edina, Eden Prairie, Minneapolis, Minnetonka, Richfield, Shoreview, St. Louis Park, Victoria, Waconia and Wayzata. Window Cleaning for the Entire Twin Cities. We maintain storefronts and commercial buildings, helping you to achieve a polished look to give your customers a good impression. We provide window cleanings ranging from weekly to annually, tailoring our services to the needs of your business. Regardless of your budget, we can put together a program for you. We’ve led the industry with a premiere safety program to ensure the protection of our customers and cleaners. We also provide the peace of mind that bonded, and insured window cleaners will be maintaining the appearance of your business.